This high powered magnet is the ultimate solution for all single pulse style cycle computers including Cateye, Specialized, Vetta, Time, Polar and many others. It works also with single pulse style Avocet systems but is not compatible with Avocet ring magnet style systems. The image above is enlarged several times actual size (the magnet is 0.100 x 0.375 inches). 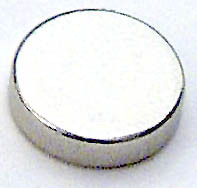 This magnet is manufactured for high end scientific applications and is simply the highest strength magnetic material manufactured. We recommend gluing this directly to your wheel spoke with tubular tire glue or double sticky tape. We advise against using Super glue, Krazy glue or other ethyl cyanoacrytate instant glues to attach this magnet to your wheel because these glues may damage the wheel surface when removed. Tubular tire glue is effective and harmless. Also see price. The best place to mount your magnet on one of the spokes that does not have a decal, as far from the tire valve as possible (this helps wheel balance against tire valve weight). In mounting, the most important issue to consider is the radial position of the magnet from the center of the wheel. Mount your magnet so that it lines up with your best computer sensor position - a position that considers all your race wheels and any training wheels depending on your computer sensor. This may take a little effort to check, but is well worth considering. It will simplify keeping your computer working when changing between wheels. For glue, we like Vittoria Mastic One, we also like Continental. The fumes from tire glue at not good for you, do your gluing in a ventilated place. To glue, put a touch of glue on the spoke in the correct position. Also put a touch of glue on the full side of the magnet and let both set up in the open air at least 30 minutes. Put another touch of glue on the same face of the magnet and put the magnet in place. Wrap the spoke and magnet with tape to hold it in position while it dries. Leave the tape in place at least 4 hours and remove when glue is set. This bond should be strong enough to hold the magnet well, but not so permanent it damages the wheel to remove it.